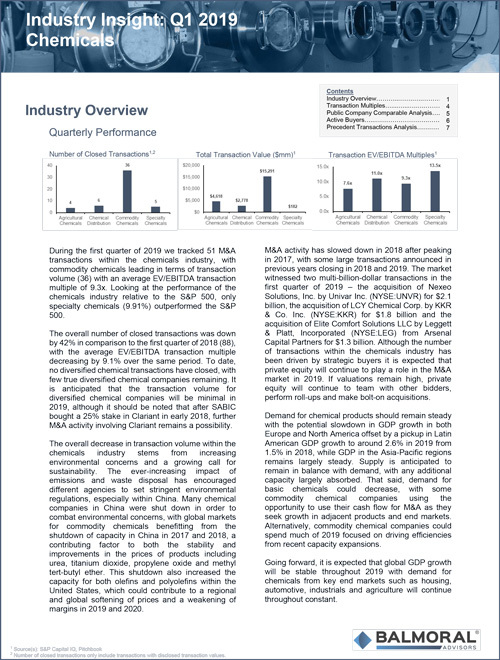 Balmoral Advisors is pleased to share with you our 2019 Q1 newsletter focused on transaction trends and valuations in the Chemicals and Materials sector, one of four key industry areas of focus for our firm. Other specialty sectors include: Plastics & Packaging, Industrials, and Food & Beverage. Balmoral Advisors is an independent, specialty investment bank dedicated to providing mergers & acquisitions, corporate finance, and financial restructuring advisory services involving mid-sized transactions. © 2017 Balmoral Advisors, LLC. Balmoral Advisors® is a registered trademark. Securities Offered Through Bridge Capital Associates, Inc. member FINRA/SIPC. Chris Cerimele and Stan Koss are registered principals with Bridge Capital Securities.